Quilt Dad: My MBS Debut! Yes, it's true! 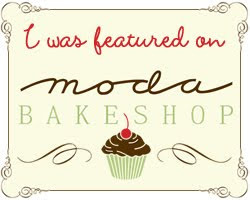 As of this morning, I am the Moda Bake Shop's newest designer! I am just so very excited to be included among so many talented quilters and sewists. This is such a personal accomplishment for me! My first tutorial (though hopefully not my last) is for a quick & easy table runner that packs a punch through the deliberate placement of color and value. I hope y'all like it. Head on over to the Moda Bake Shop, check it out, and let me know what you think. I'd love to hear your feedback ... but seeing as it is my first time trying to write any type of project instructions, please be gentle! If you make one, I'd love to see it. Also, be sure to add it to the MBS Flickr pool! I'm not finding your tutorial. Maybe it's not up yet? Sew exciting John! You did a great job! And I love the table runner! Fresh was a great choice! Congratulations! Just the thing for my honey bun! & very easy to follow. 2 thumbs up for sure!!! & i'm SUPER happy you are a part of the mbs fam now!!! Congratulations! Love the happy colors! Congratulations John! How very exciting! I'm sure you're family is very excited for you too! Way to go! Wow! That's terrific John. Plus it looks like a great pattern. It's one of my favorite kinds - looks complicated - but with easy instructions - I can't wait to try it. Congrats, that is very exciting! Awesome job, John!! I love it! Congratulations. Really love your colourchoice and the easy pattern.And the tutorial is great for me. THANK YOU THANKYOU THANK YOU THANK YOU! Love it. I just found your blog from the MBS. Love the table topper. I am now a follower of your blog. Your style is quite inspiring. Congrats on being featured!! The project looks lovely! GREAT tutorial! Congrats on being an official designer! I'm going to try those blocks someday, they look like a snap! I think your tablerunner is charming and you did a great job on your tutorial. It's nice to have a guy designing for the Bake Shop. Nice blog too. I'm going to have to come back and check it out. way to go john! well deserved! Love the table runner - I had to laugh when I saw your profile. I am originally from NJ and now live in Holly Springs. Happy quilting! I love it! The tutorial is awesome and the finished product is awesome! I can't wait to make mine...off to buy a honey bun! WOW! Can I have your autograph? Congrats on your debut! The tutorial is easy to follow and gorgeous! I love your choice of fabrics. I enjoy reading your blog and hope you have many more great projects to follow. I was just over there and saw your tutorial. Love it! Such a fun runner. Congrats on being a Moda Bake Shop designer!! Again Congrats on the Bake Shop gig...I'm looking forward to your next tutorial. Just stumbled upon your blog. You do beautiful work!! I can tell you love Anna Maria Horner, me too! I will definitely be a regular reader. Hello, I saw your table runner on Moda Bakeshop and loved it! This is the first time I visit your blog and found it so interesting, now I'm going to have a more detailed look. Your quilts are so bright, beautiful! Congrats, John! What an honor! Love the table runner - the colors are so bright and fun! Wow way cool John. I love how you worked the colors in the table runner! Great job. Great idea. I'm going to cheat and use some cheater fabric I bought that's printed in strips. I can't wait to get cutting to see what I can come up with. wow, saw your quilt on Moda Bake Shop and I have to say I'm soooo impressed. Love the quilt and amazed that a guy made it!! Now that I've seen your profile photo having a hard time picturing you hunched over a sewing machine!!! oops not quilt, table runner!! Sorry! I have just come from the bake shop & I have to tell you that I simply LOVE your tablerunner. You have used my favourite fabric and technique. I WILL be making me a tablerunner as soon as I get me a honeybun. Wow - it is fabulous! Nice work! Thank you for sharing more of your talent! Congrats John! Love the table runner - great use of honeybuns! I frequently have customers wondering "what do I do with these"...now we have another answer for them...thanks! Congratulations, and way to go, the table runner is stunning! Thanks so much for the tutorial for this wonderful runner. I have some honey buns just waiting to be used. Can't wait til they post the pdf so I can print it out. Very easy to understand instructions...great job. Yay John! Way to go! You make us quilt guys proud! Congratulations on the Moda debut! I am so impressed. Congratulations! What a great project! Congratulations! That is such exciting news and I am so happy for you. Wow-you are famous! You should be very proud...great, simple tutorial! The tablerunner is darling...just measured my dining room table top! Congrats, John! That's so exciting! And the tablerunner is stunning--I can't wait to use a honeybun I've been saving (Wonderland by Momo) for one! The tablerunner is beautiful, well done you!! I visit MBS daily and discovered your blog... you are just too clever! Congratulations for featuring on MBS and I'll look forward to checking out your blog for more inspiration! congratulations to you, john. You so deserve it!!! Congratulations John!!! I love your tablerunner. I too like a long tablerunner. Your choice of honeybuns is awesome. I really like the bold colors in Fresh. Your tutorial was great. You did an amazing job. Love & blessings from NC! I love your table runner but it hasn't gone printer friendly yet. Congratulations, John! I just used that same fabric for a jelly roll top -- and love it! Great tutorial! Hi John ! I am quite new to quilting and want to try out your table runner. But I have one question do we need batting for this of do we quilt only the top and the backing ?